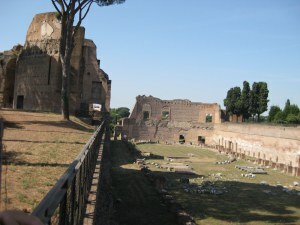 The imperial palace on Palatine Hill. “I hate it here,” said the immaculate beauty in front of me, in Russian. It’s a familiar story. Rome is the grand dame of the Grand Tour, but it’s the European destination that people love to hate. It’s too big, sniff the naysayers, too expensive, too hot. All wrong: it’s magnificent,and here is my riposte to the six most common moans about Rome. August is the peak of tourist season – and the worst possible time to visit. Rome in August is a sizzling frying pan for 12 hours a day, and no matter how tantalizing the airfare, you must not succumb. It’s 36 degrees Centigrade all the time, there are no clouds and it never, ever rains. Even worse, the heat will compel you to don huge sunglasses and a stupid-looking hat, the functional equivalent of a neon sign blaring “I’m a tourist! Rob me immediately!”. All Romans who can afford to do so flee the city in August for the cooler shores of the Adriatic or Mediterranean. Those who cannot, park themselves at nearby Ostia beach. So do as the Romans do: go somewhere else. Of course it’s too big. It’s the Eternal City, for pity’s sake, and you should not even attempt to see it in three days. It’s silly to whine that Rome isn’t a cobblestoned, cheese-nibbling, damsel-in-distress little Euro-village. Rome was never meant to be quaint – it was the mighty seat of the greatest of the ancient empires, and its main attractions (e.g. the Colosseum, the Forum, the Pantheon, the Imperial Palace) are all colossal things which require a lot of space. Furthermore, Rome is a modern city with nearly three million people in it (it’s Italy’s capital), so if you were hoping to watch kerchief-clad peasants pound salami with their bare fists, you have come to the wrong place. True, but only if you eat three bloated meals a day in the tourist traps, cab it everywhere, and cling to the downtown core like a dead leech. Luckily, this is easily remedied. First, don’t take taxis. Everything of interest in Rome, including Ostia beach, is within walking distance of the metro system, which is clean, fast, frequent and about half the cost of TTC fare: 1 Euro. Second, give the restaurants a rest and visit a rosticceria or a tavola calda for a taste of Italian-style fast food, which usually includes wonderful dishes like insalata di frutti di mare (seafood salad, but the North American stuff loses much in translation) and herbed pork. Finally, travel outside the downtown core (the neighbourhood around Numidio Quadrato station is excellent) and suddenly everyone who speaks English evaporates – and with them the sky-high prices. 4. The food isn’t good. This is the most insidious untruth of all: Roman cuisine is heavenly. However, Rome, like almost every city in Europe, is mined with a devious network of lousy restaurants engineered to ensnare tourists. The most unspeakable thing I witnessed was Caesar Salad pizza, which consisted of Caesar Salad shovelled on top of a pizza, nuked for about one minute in the microwave and served with a flourish. How to avoid these dens of vice? The obvious thing is to choose restaurants which aren’t parked immediately outside the main attractions, and which contain a high concentration of Italians. A less obvious thing to do is to try the markets, which usually carry a huge selection of superb garden produce, almost always locally grown. Most supermarkets operate their own bakeries and offer delicious fresh treats like olive and cherry-tomato topped sweet buns at a fraction of the price you’ll pay at a restaurant. Then don’t be so lazy. Either get up early (8 AM should do it) or buy your tickets in advance. The conga lines that loop around the Colosseum are for people who slept in until 12 or didn’t bother buying a Roma pass or a Roma Archaeologica card, both of which are excellent value and can be picked up at dozens of locations all over Rome, including Fiumincino airport. With ticket in hand, you shall snicker cruelly as you sidle to the front of the line. 6. I just don’t like it here. This is probably the most common complaint. Well, what did you expect? Rome was the greatest city of ancient times, but it was essentially asleep for a thousand years after the fall of the Roman Empire (it only just started to wake up during the Renaissance). If you don’t care for ancient history, and it’s old-master art, scenic bridges and sumptuous royal palaces that you’re really after, you should stay in Florence or Venice. Rome is home to some of the most spectacular accomplishments of Western civilization (the Pantheon! Still the largest unreinforced concrete dome in the world! ), but if you harbour no love for ancient times, it’s just a pile of old rocks. I quite enjoyed Rome, however much like cairo, once you have seen the “hot spots”, very little compelling reason to return.